On Monday, December 12. 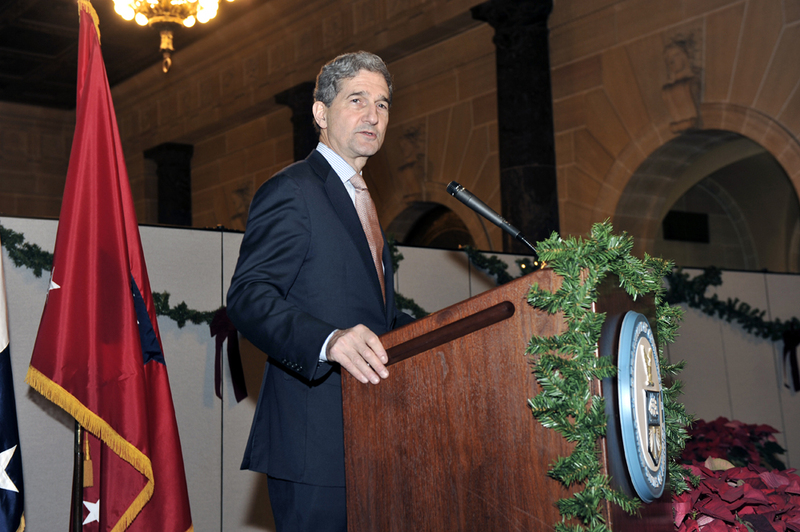 2011 General Counsel Kerry presided over the Office of General Counsel Annual Awards Ceremony. He was joined by Secretary Bryson who delivered remarks, thanking the office for their tireless work over the past year. The Secretary acknowledged the great assistant that the office’s attorneys and support staff have provided to him since his start at Commerce and he looks forward to working closely with the staff. He introduced GC Kerry, who detailed the broad range of accomplishments achieved by OGC office over the past year. He highlighted the successful completion of Patent Reform and the successful litigation of the Supreme Court Case Golan v. Holder (10-545 ). He also applauded OGC’s contributions to various other litigation matters as well as works in enforcing fisheries regulations and export controls. Robert significantly advanced the goals both of the USPTO and the Department to establish a strong patent system. Thanks to his efforts at the Supreme Court, the Court adopted the Department's position which has been haled as resulting in stronger and more reliable patent rights. Robert was also instrumental in a wholesale re-writing of the rules governing how appeals are conducted at the USPTO Patent Trial and Appeal Board which will lead to more efficient review of patent applications. Robert routinely provides expert advice under tight deadlines on complicated matters. Debra provided crucial support to the Gloucester's Enforcement Section office maintaining continuity of operations in that region in the absence of any enforcement attorneys for most of the year. During this time, she continued to coordinate enforcement matters with the Office for Law Enforcement, fielding as many inquiries herself as possible, while judiciously referring others to headquarters for resolution. Debra also responded to a large number of requests for case information from the Special Master who was appointed by the Secretary of Commerce to review fisheries enforcement, thereby greatly enhancing the Special Master's ability to timely complete his review. After 34 years of support to the NOAA Office of the General Counsel, she continues to be cited by colleagues at all levels for her exceptional performance and willingness to take on new tasks and increased responsibilities. 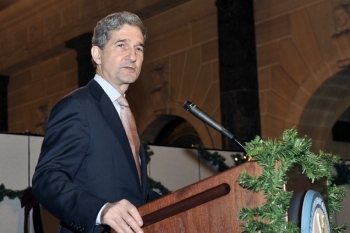 On Tuesday, December 14, 2010 General Counsel Kerry presided over the Office of General Counsel Annual Awards Ceremony. He was joined by Secretary Locke who delivered remarks, thanking the office for their tireless work over the past year. The Secretary acknowledged the critical role that the office’s attorneys and support staff played in helping him implement a number of important Department and Administration priorities. He introduced GC Kerry, who detailed the broad range of accomplishments achieved by OGC offices over the past year. He highlighted the role OGC played in the successful completion of Phase 1 of the American Reinvestment and Recovery Act and the successful litigation of the Supreme Court Case Bilski v. Kappos (08-964). He also applauded OGC’s contributions to the successful execution of the Decennial Census, ongoing Oil Spill litigation, and Export Control Reform. Rayna has provided exceptional legal services during the past year, and made very significant contributions which have advanced several critical missions of the Department. Nowhere were her abilities more evident than in her effective advice to, and representation of, the Census Bureau during the 2010 Decennial Census. More than any other staff attorney in the Department, Rayna’s actions provided the Census Bureau with the ability to hire and retain the workforce necessary to complete its Constitutionally-mandated duty to render an accurate count of the Nation’s population. Michael served as the IT Liaison/IT Specialist assigned to the Office of the General Counsel at the Patent and Trademark Office. He has been the “go-to” person to get things done and is a model teammate who set a positive example. Michael exhibited great dedication to his technical support work while serving as the IT expert for services, system development, and coordination with OGC, USPTO, and DOC customers, frequently working long hours to provide IT customer service and systems design support. He consistently volunteered to help attorneys, paralegals, and support personnel with a myriad of IT tasks to ensure legal mission requirements were met. Michael has been a leader on the EDMS project and a leader in the OGC Technology Working Group.